Sometimes I think that I should be a paid spokesman for Ziploc. More often than not, dinner at my house either starts in a Ziploc bag full of marinade, or ends up in a Ziploc bag in the freezer. I am not a fan of bland meat. Honestly, I prefer my meat to taste like something other than meat (except for the occasional really good-quality steak, and even then I tend to be a heavy seasoner). Which is probably why I lean towards Asian cooking so often. Soy sauce, ginger and garlic are a great cure for flavorless chicken breasts. This dinner is not at all Asian, but does start in a Ziploc bag full of strong flavors. Mediterranean cooking is also one of my favorite styles, with heavy use of olive oil, vinegar, oregano, feta cheese. No wimpy flavors here! These filled pita pockets can be made with chicken or pork, but I prefer pork-either a pork tenderloin or a pork loin. The loin is a little tougher cut of meat, but if you leave it in the marinade long enough (overnight, at least), it will be tender when cooked. The sautéed pork is combined with peppers, onions, feta cheese and tzatziki and can be served in pita bread pockets or on a bed of lettuce for great salad. Combine cubed pork with marinade ingredients (next 10 ingredients) in a Ziploc bag. Refrigerate several hours or overnight. Drain pork in a colander. Sauté in a large skillet for 5 minutes; drain any excess liquid. Cook 10 minutes longer, or until pork is cooked through and nicely brown. Add peppers and onions to skillet; cook until tender. 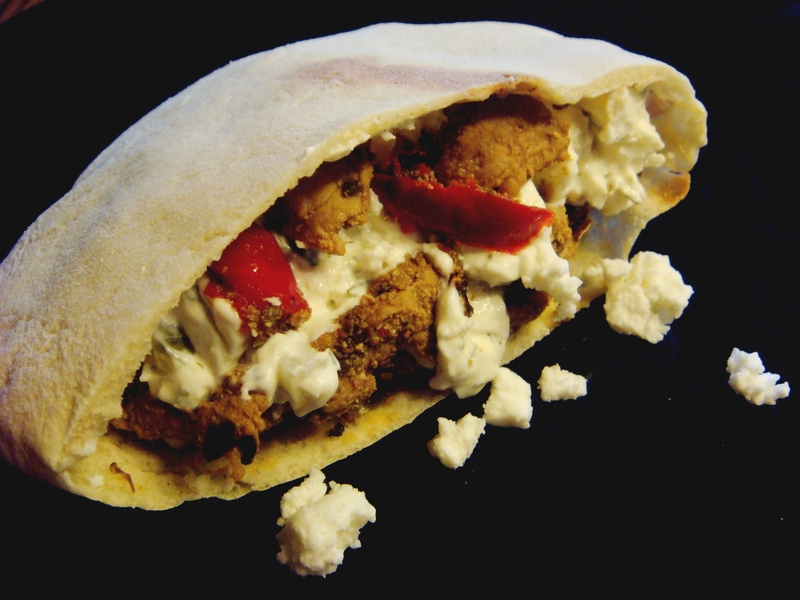 Serve pork in pita bread halves with feta cheese and tzatziki. OPTIONAL SERVING VARIATION: Serve cooked pork, onions and peppers on a bed of Romaine lettuce, topped with the tzatziki and feta cheese. Line a colander with cheesecloth (or a coffee filter) and place over a bowl. Strain yogurt in cheesecloth in refrigerator for several hours (or overnight) until very thick. Grate cucumber (unpeeled), sprinkle with salt and drain in colander until most of the liquid is removed. Combine yogurt and cucumber with remaining ingredients. Add additional salt (usually about ½ tsp) to taste. Refrigerate several hours to blend flavors. While you can always use pre-made, tomorrow I will share my recipe for homemade pita bread. They really make a huge difference, and are not difficult to make. Even my husband really liked this recipe- he had seconds! !